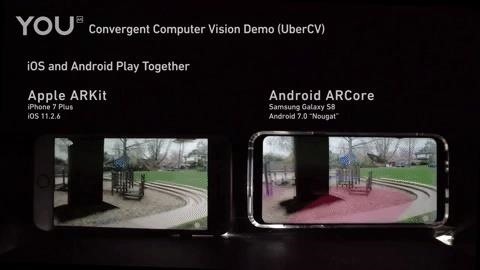 Compatible with ARKit, ARCore, and other computer vision systems, YOUAR's UberCV system uses computer vision to enable AR cloud localization, enabling apps to display content in the same position between multiple users. The company demonstrated some of that cross-platform capability in a YouTube video (below) posted earlier this week. 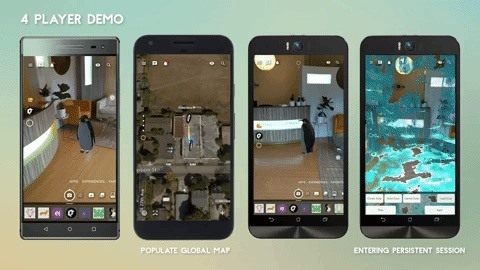 "ARCore and ARKit do not currently allow users to reload localization information, so they cannot save dynamic content and nothing is permanent," said Carlo Calica, YOUAR's CTO, in a statement. "With UberCV, YOUAR environments and content is persistent. Users can add new content in person or remotely and when you open the app, everything is right where you left it." The platform makes it possible for an iPhone and a Samsung Galaxy device to identify landmarks and view the same content in the same location, simultaneously. This capability will be crucial for future multiplayer gaming and shared social experiences. The company is encouraging interested developers to register for early access to the platform on its website. "Combining Android and iOS platforms is just the beginning," said Ray DiCarlo, the CEO of YOUAR. "UberCV highlights our ability and commitment to deliver open, social AR Experiences across all platforms, not limited by brand or device type. Allowing users to choose any AR-enabled device to engage in real-time interactions within the same persistent Augmented Reality experience is the key to unlocking powerful social AR." YOUAR joins Blue Vision, Ubiquity6, 6D.ai, and Niantic's Escher Reality as companies offering some flavor of the AR cloud or multi-user AR capability. With Apple reportedly holding back a shared experiences feature from ARKit until 2019, these companies have a limited but major opportunity to fill a gap in the market for developing AR apps that let everyone play in the same AR sandbox, regardless of device or platform.